Not often seen in gardens this excellent winter blooming Manzanita has been a fantastic performer in PNW gardens. 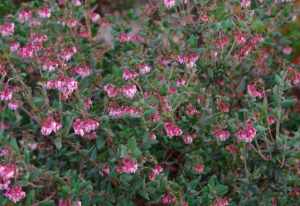 Upright growing shrub with blue foliage- new growth is dramatically tinted red. In January to March copious bright pink clusters of urn shaped flowers appear. Anna’s hummingbirds are not far behind. To 5′ x 5′ in 6 years in full sun and average, well drained soil. No summer water when established. Excellent winter blooming shrub that is always good looking.